It is believed now that the dead man on the property was Tom's longtime friend and partner, Bruce Stephenson. When officers arrived, they found a man grazed by a bullet. He was treated by paramedics on the scene, and later taken to a local hospital as a precaution, Zabaleta said. A second person barricaded himself inside the home. Police were later joined by Miami-Dade Fire Rescue’s venom unit because the home at one point had been used for snakes, including some that were venomous, Zabaleta said. Miami-Dade property records show that the property is owned by Bruce W. Stephenson. Stephenson is listed as a business partner on the website for Tom Crutchfield’s Reptiles, based in South Miami-Dade. About 7 p.m., police went inside the home and found the man dead, Zabaleta said. Miami-Dade police homicide detectives are investigating. Police did not release the names of the men Thursday night. To read more, visit the Miami Herald. Our thoughts still remain with everyone at The Farm. SRT members approached the home on an armored vehicle, and stayed stationed outside until just before 8 p.m. when officers moved in and discovered a dead body. The deceased person has not been identified. Miami-Dade Police confirm to CBS4 they have now opened a homicide investigation. Our thoughts are with Tom and Patty as the dust settles and we are thankful they escaped with only a minor injury. As we know more we will pass it along! Nationally recognized reptile breeder and importer Tom Crutchfield was slightly wounded in a SWAT standoff today at his facility in Florida when an unnamed gunman opened fire in his shop, according to his daughter Michele. Tom and his wife Patty escaped without serious injury but Michele wants to thank everyone that has reached out to her to express their concern. The gunman currently remains holed up in the facility. Tom is a longtime reptile importer and exporter and was a guest during kingsnake.com's chat month symposium earlier this month where he took questions from kingsnake.com's users about his years in the hobby. 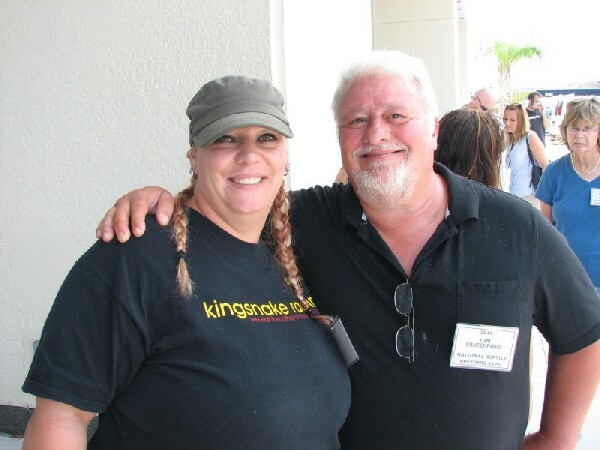 Pictured here with kingsnake.com's Cindy Steinle, kingsnake.com wishes Tom a speedy recovery. Thank God Tom and Patty are OK. I hope everything ends safely, and the gunman surrenders. The shooter was Bruce Stephenson, the true owner of the property the company. Glad to hear you and Patty are ok Tom. I'm glad that Tom and his family are OK.